As a response to the rising public transport needs and to mitigate escalating vehicular traffic, Hyderabad city launched the longest Metro rail in the Indian Metro project, inaugurated by Prime Minister Narendra Modi on November 29th 2017. Hyderabad reigns on the 7th place with metro rail brought into the city. It is the cheapest and undoubtedly the fastest way to travel around the city. 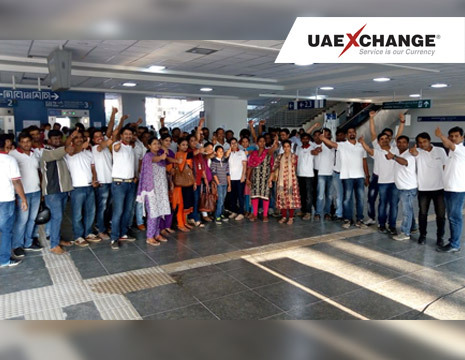 UAE Exchange India is one of the best and renowned financial service providers with its penchant quality and optimized service trends. Connecting people and creating progress with the finest of quality is the vision of the company which has made it extend its frontiers to over than 375 locations serving a population of 1.25 million people under the proficient support of 3500 employees. The company helped to provide excellent service in Foreign Exchange, Money Transfer, Air Ticketing & Tours, Loans, XPay Cash Wallet, Insurance and Share Trading.